The Environmental Law Centre is calling for a rethinking of water law and policy in Alberta. The ELC’s report Future Flows: climate resilience, environmental flows and Alberta’s water law explores existing legal mechanisms to deal with maintaining and restoring environmental flows in our rivers and streams today and into the future. Upcoming webinar (February 20, 2019, noon) register here. Making informed and science based decisions regarding environmental flows is made challenging by the complexity of hydrological systems and their interrelationship with aquatic and riparian ecosystems. This challenge is magnified by climate change. Responding to data and climate uncertainty requires ongoing monitoring and research. Uncertainty also requires management and governance systems that are responsive. Making effective environmental management decisions is also challenged by the historic approach to regulation and allocation of water rights in Alberta. Alberta’s Water Act, while a step forward from previous provincial water legislation in terms of adaptation and planning, remains inadequate to the task of ensuring sustainable and resilient environmental flows for the province. Having a regulatory system that is responsive to evolving knowledge and flows is essential to the long term sustainable management of river flows. 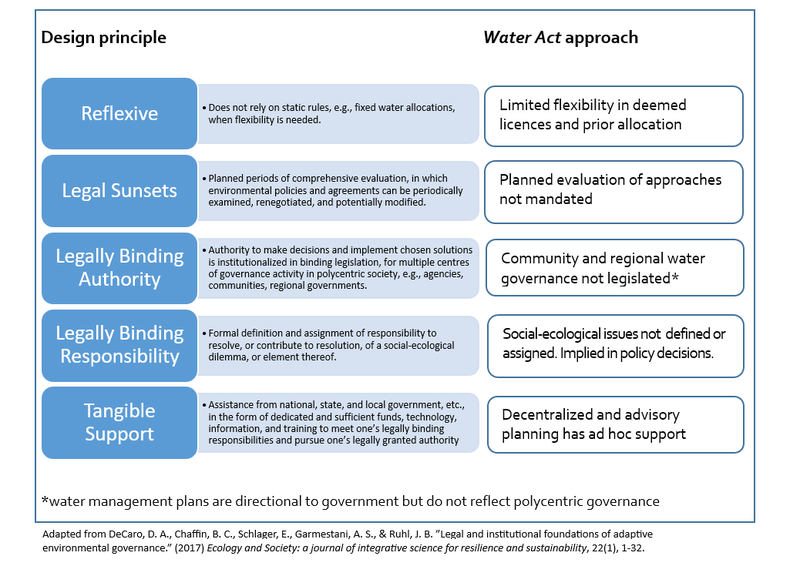 Future flows highlights some of the challenges faced in managing for instream flow needs and assesses the current law and policy framework for its ability to manage flows in a precautionary and adaptive manner. The Environmental Law Centre recommends amending our water law and policy to ensure precautionary management of environmental flows in Alberta watersheds, particularly where surface water allocations are still available. In watersheds that are highly allocated our laws must become responsive to adapt to changing information and circumstances. These recommendations are focused on ensuring that future water supplies are sufficient to maintain and restore environmental flows. 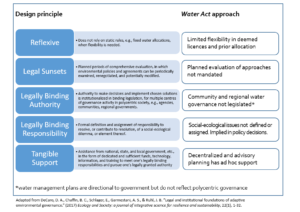 Revise the Framework for Water Management Planning to include climate mitigation modelling and water allocation budgeting and decision making. Require review and revision of plans on a periodic basis (i.e. 5 year cycle) and submit for approval to the Lieutenant Governor in Council. Draft and publish water wastage guidelines to empower the Director to issue orders for conservation purposes (as per sections 14 and 97(2) of the Act). Develop directional policy for exercise of conditional restrictions to protect base flows for all licences (i.e. deemed licences and licences issued under the Water Act). Review legal options for exercise of discretion in relation to conditions on deemed licences to respond to diminished base flows. Formalize guidelines for determination of “potential” effects on the aquatic environment in allocation decisions. Develop a system of tracking and public reporting to identify any instream objectives, water conservation objectives (as applicable) and a science based instream flow needs (IFN). Report annual incidence of exceedances of these metrics. Ensure public access to the water use reporting system and the data it contains. The current system lacks transparency. This transparency is required to ensure a broader civic monitoring role and to foster accountability in environmental outcomes. Enable regional and community co-governance with related authority over water allocation. Require the Director to consider instream flows informed by cumulative effects of allocations, land use impacts on water and future climate scenarios. Require water budgeting at appropriate time scales to maintain or restore instream flow needs. Require periodic water need assessments that incorporate conservation and efficiency practices. Streamline licence cancellations for non-use. Streamline suspension process to respond to environmental risks (with accompanying compensation policy). Develop and implement a water fee structure to support water monitoring, planning and to support a deemed licence compensation policy (as needed). DeCaro, D. A., Chaffin, B. C., Schlager, E., Garmestani, A. S., & Ruhl, J. B. ”Legal and institutional foundations of adaptive environmental governance.” (2017) Ecology and Society: a journal of integrative science for resilience and sustainability, 22(1), 1-32. Webinar: Future flows: Water law and policy in Alberta for a sustainable future. Date: Wednesday February 20th, 2019. Join Jason Unger, Executive Director of the Environmental Law Centre, to explore how water law and policy may better serve instream flow needs today and into the future. Thank you to everyone who was able to attend the webinar on February 20. The webinar recording (audio and video) can be replayed here. Slides from the webinar can be downloaded here. Leave your comments and questions for us below. Find out about our next webinar and get notifications when we publish new blog posts by subscribing on the right hand side. Of backhoes and water woes: reviewing the breadth of landscaping regulation under the Water Act.